With the American Originals Copper Dark Oak 3/4 in. x 3-1/4 in. Solid Hardwood Flooring you can enjoy the natural beauty of oak's rich, robust grain characteristics throughout your home. The planks have micro edges and square ends for a classic, linear look. It has the Bruce DuraShield finish for durability and beauty. Copper Dark Oak 3-1/4-inch x 3/4-inch Solid Wood Floor (22 sq. ft. / case) With the American Originals Copper Dark Oak 3/4 in. x 3-1/4 in. Solid Hardwood Flooring you can enjoy the natural beauty of oak's rich, robust grain characteristics throughout your home. The planks have micro edges and square ends for a classic, linear look. It has the Bruce DuraShield finish for durability and beauty. 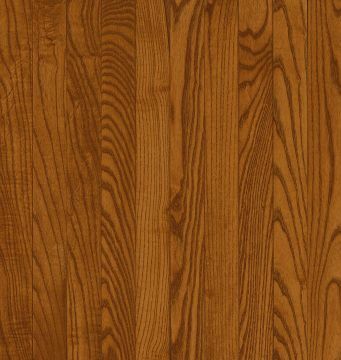 Copper Dark Oak 3-1/4-inch x 3/4-inch Solid Wood Floor (22 sq. ft. / case) is rated 4.4 out of 5 by 17. Rated 5 out of 5 by Bobbi from Looks awesome!... Looks awesome! Rated 5 out of 5 by HomeDepotCustomer from AWSOME & WONDERFUL EXSPERIEMCE !!!... AWSOME & WONDERFUL EXSPERIEMCE !!! Rated 5 out of 5 by fussy from We just installed this flooring in our kitchen after many attempts to match existing flooring. C... We just installed this flooring in our kitchen after many attempts to match existing flooring. Contractors were pleased, easy to install and we love the warmth the hardwood adds to our new white cabinetry. So far so good, now we will see how it holds up.